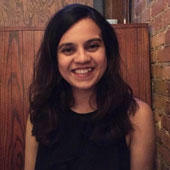 Ruchi is currently a master’s student, studying UX Design and Human Computer Interaction at the University of Michigan. Driven to understand underlying problems and design elegant solutions for them, she transitioned from her work as a Front-End Developer at Flipkart.com, an ecommerce system, to becoming a Product Designer at Sumo Logic. She is passionate about crafting seamless experiences for Web, mobile, and voice-based applications. She is part of the leadership for Women in Voice. Connect with Ruchi on LinkedIn.